Solid brass legs, piers, calender/zodiacal ring, solid brass planets and Sun. Other materials: calender ring mount is solid walnut; gears are cast bronze; all moons are semi-precious blue lace agate. Handcrank mechanism is housed discreetly below, but in fully exposed view. 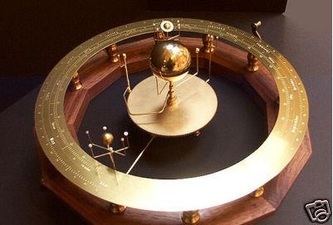 By means of the handcrank movement, planets depict rotations in correct relative orbital speeds. 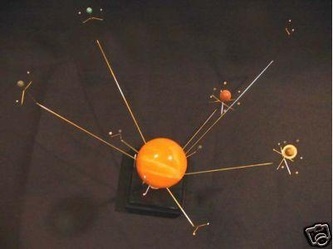 Six brass planets, Mercury through Saturn, are represented per the known solar system (during the classical period suggestive of the piece--17th century). Earth's moon is represented in motion also encircling the Earth, as they together correctly orbit the Sun. Calender ring marks the passage of months and days of the year through the astrological named divisions of the ecliptic. 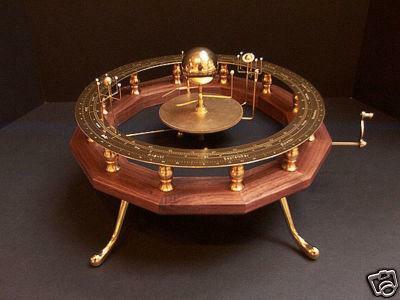 This beautiful orrery arrives with a companion set of Sun and planets made of semi-precious stone (Sun and Mercury through Saturn) which may be displayed separately as a static stand alone art piece on the solid oak stand included. 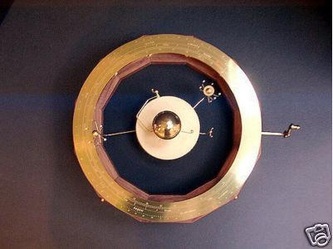 The clockwork mechanism was engineered and is made by the artist, having built and sold many thousands of orreries and science instruments since 1992. Mechanism comes with assembly instructions. Shipped insured.